Or, "How to Survive Getting Run Over by a Bus"
Or, "The Hardest Thing I have Ever Done"
The irrepressible feeling of happiness and nervousness that I got when I received the acceptance email from David Horton reasserted itself as I rolled into Camp Bethel on Friday night. I was excited to be there, and ready to face what I knew would be a very challenging event. Little did I know how deep the rabbit hole would go. I arrived in time to catch the race briefing. This was one of the most informal race briefings I'd ever been to, as seemed appropriate. 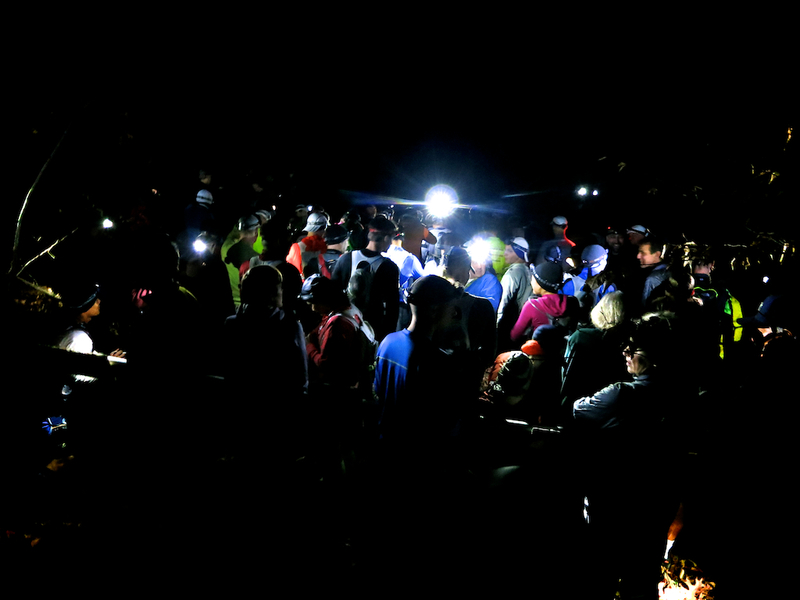 Hellgate is known as a semi-invitational race; Horton approves each and every runner that applies, so the general feeling was that everybody there knew what was up. He gave a short description of the course and answered a few questions. The best news I got out of the briefing was that due to dry weather, we'd be able to get through the race without mandatory wet feet. This was huge because "wet feet" for me generally sounds like "blisters", which proved to be my downfall leading to a DNF at Grindstone. After the briefing I went back to my car and began some assembly work on my gear. I'd already done a pretty thorough job packing, making a list and checking it twice (maybe even three times) on Wednesday night. After making my final clothing selection (shorts and a T-shirt, arm warmers, light long sleeve, and a Buff twisted into a cap), I curled up to try to rest my eyes for an hour or so before the caravan of carpoolers left for the start. Around 10PM, I started getting dressed and making my final preparations. Mike Dunlop was kind enough to give me and a few other folks a ride up to the start, which was about 40 minutes away at Hellgate Creek. The caravan left Camp Bethel in a cloud of dust and pulled into the start area at around 11:25. 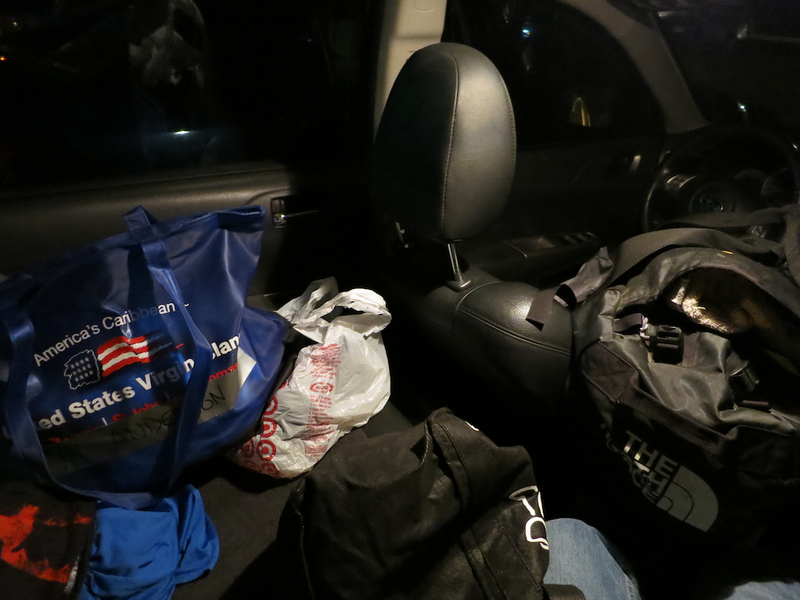 I checked in with Clark and Horton, and dropped off my drop bag. We sat in the car for a few more minutes, warding off the slight chill in the 45 degree air. Eventually we saw a steady stream of runners making their way to the start line and followed suit. I overheard at the line that there were 139 runners starting, which is a pretty decent crowd. The national anthem was sung, followed by a brief prayer. Now, I'm not a particularly religious person, but in retrospect saying a prayer before embarking on this intense undertaking one minute after the stroke of midnight seems entirely appropriate. With that, we were off. Say your prayers... it's about to get real. 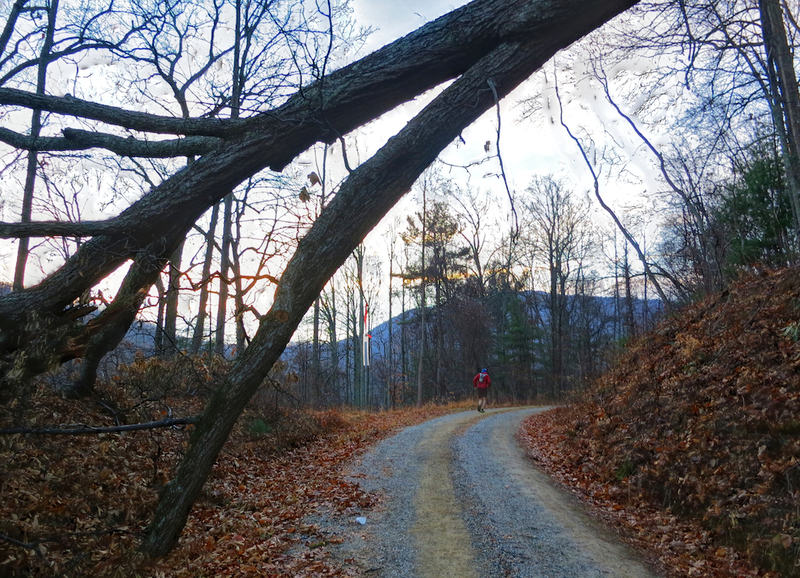 The first few miles were on leaf-covered jeep trail, not too technical and very runnable. Eventually we broke out onto a gravel road, which appeared to wind all the way up to the stars shining in the clear sky overhead. 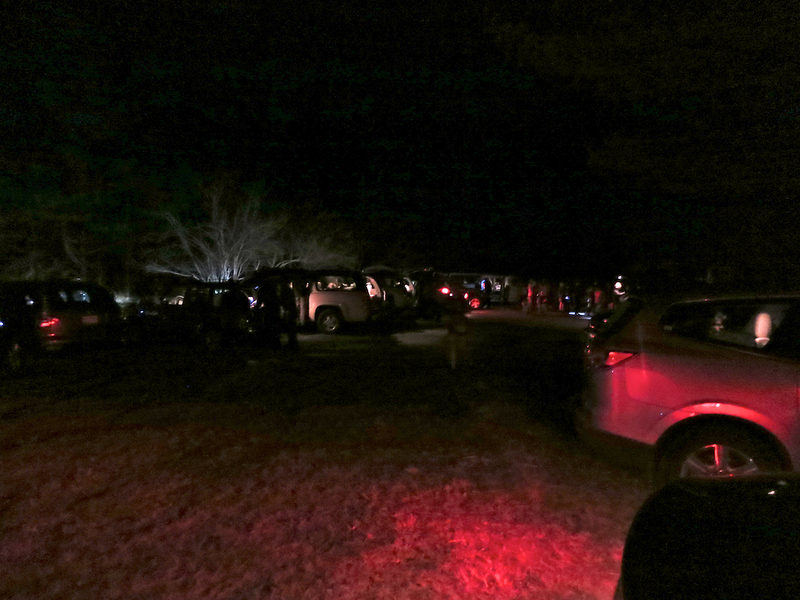 Above me, people's headlamps shone with a blue clarity that resembled those same stars. Since the way was smooth and clear, I shut my light off and walked up the road by starlight. It was beautiful. Near the top of the road climb there was a bend which offered a great view of the sky, the lights in the valley below, and revealed the immensity of the Blue Ridge mountains by their omission of starlight. Surprisingly, the sleep deprivation was not affecting me too badly. However, I was having some gastrointestinal issues; I'm not sure what caused the problem, but I narrowly avoided shitting my pants (pardon my french) and had to make a couple trips into the woods to take care of business. This sucked because each trip into the woods cost me about five minutes, and every time I came back out I felt like I had to pass 10-15 people to catch back up to who I had been with before. After the second time, I decided to eat the Imodium pill that I had brought in my first aid kit, and this seemed to help. Next time I will bring two pills, as I believe that is the proper dose. Once again, the sage wisdom and advice of Mr. Snipes came to my rescue in this particular scenario, as I had thought to bring a couple of baby wipes in a zip-loc bag. Low tech, but infinitely better than leaves. Aid Station 2 and 3 came and went without much ado. My legs were feeling good and I was cruising at a nice mellow shuffle pace. I caught up with Sniper, Max, and Mike, and yo-yo'd with them for a while. I got a kick out of the fact that the four of us all had exactly the same gaiters, three of them identical down to the color scheme. My memory of the night time and the order of trails is a bit blurry, but I do remember coming down a narrow section of decidedly non-bench cut off camber singletrack and making a right onto a dirt road climb. It looked very familiar, because I had been there before at Terrapin Mountain earlier in the year! We also ran on a beautiful section of grassy trail that had been part of Promise Land. This section was exceptionally pretty because the dew made the grass all silver in the light of my headlamp, and the stars were out very bright with a picture-perfect arc of the moon in the sky. It was like running through a dream. At Aid Station 4 (Headforemost Mountain) my drop bag was waiting for me. I changed socks, and swapped my Buff for a baseball cap, as the sun was due to come up in an hour or so, and I wouldn't see my drop bag again for quite some time. I also smeared some sunscreen on my face and re-upped my supply of gels and Shot Bloks. The long downhill into Aid 5 was very enjoyable, a nice gentle downhill grade that was a lot less steep than it appeared on my cheat-sheet profile chart that I was carrying with me. At Aid 5, they were cooking up breakfast and I ate some eggs and sausage, as well as a couple of shortbread cookies with Nutella sandwiched between them. This turned out to be a mistake (albeit a delicious one). Within a half mile of leaving the aid station, I had an urgent Defcon 5 need to take a dump. I did so and felt better. This is what happens when you try to put sunscreen on in the dark at 4AM. When I came out of the woods (for the last time in the race, thankfully), Sniper, Mike, and Drew were hoofing it up the road in my direction. I'd run with Mike and Drew before, and I decided to hop on their party train. We made good time, at a nice comfortable pace going up the road. Near the top, Snipes began to complain that he was a bit tired and asked anybody and everybody for some No-Doze or caffeine pills. At the top of the hill, he finally got some from somebody that we passed. Drew and I continued to shuffle along as the trail turned downhill, as the other two paused so Sniper could get his pills. About 15 minutes later, Sniper and Mike came tearing through like their feet were on fire. I decided to hop on their speedwagon, since I felt like my comfortable pace was only a mental function and that my legs could take a bit more. I managed to hang on while Sniper and his rocket-pills pulled us. Drew dropped off the back somewhere along the line, and I began to feel the impact of the increased pace by the time we got to the climb up to Aid 6 at Little Cove Mountain. They stopped to drop off a few items with their crew, and I shuffled on to the aid to get my bottle and hydration pack refilled. 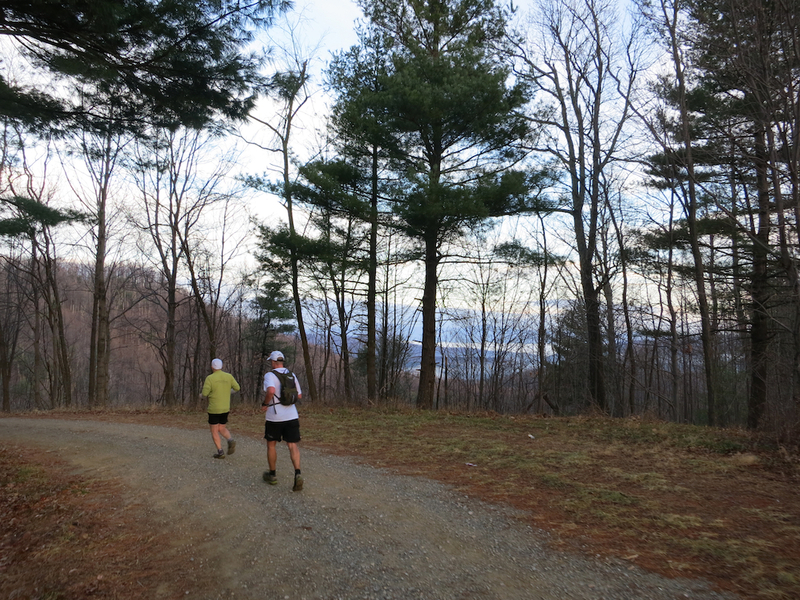 I new that the next section would be a beast - it was 9 miles to the next aid station at Bearwallow Gap, where the second hard cut-off time of the day stood at 12:30PM. It was only 9AM or so. 3 and half hours seemed like plenty of time to travel 9 miles, but I remembered hard-earned lessons from Grindstone; you can't think about distance in a road-runner's mindset. Sniper and Mike dropped me immediately after leaving at the aid station; my hips were starting to tighten up and I just couldn't rev up to their pace fast enough. 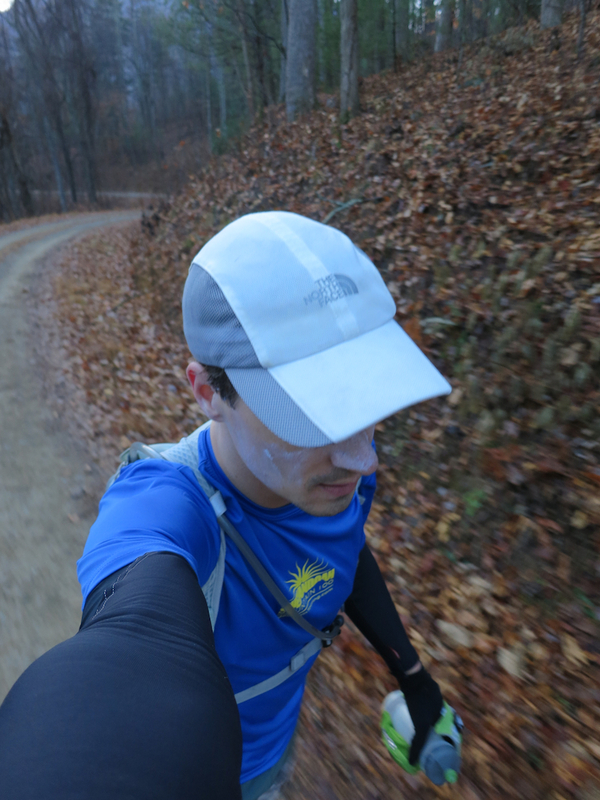 When I did get going, I made the decision to keep it at a nice easy trot as I realized I couldn't keep the same hammering pace that we had been making earlier. Drew caught up to me, chatted for a bit, and then pulled away. About 4 miles into the 9 mile stretch between Aid 6 and Aid 7, my stomach went into a full-on rebellion. When I ran, the jostling caused some major discomfort, and all my food and sports drink felt like it would come right back up as soon as I washed it down. I had to stop several times, clutching my stomach in the hopes that somehow it would get better. I had also taken a 5-hour Energy shot at Little Cove; between the sleep deprivation and the wackiness caused by 8,000x my daily vitamin-B requirement or whatever devilry they pack into that little bottle, my head was pretty messed up. I got dizzy and spin-headed each time that I stopped, and it took about 15-20 seconds after I resumed walking to clear the cobwebs from my brain. People started to pass me each time I stopped. When I was moving, it was at a crawling walk, unless it was on a good downhill, on which I could manage a slightly faster speedwalk/shuffle pace. I was pretty miserable, and kept talking to myself like I was a three-year old, telling myself how great I was doing, how all I had to do was keep putting one foot in front of the other and it would be OK. I didn't let my head sink into negativity, which was a blessing, although a pragmatic part of me had the occasional questioning doubt as to whether I would be able to make it to the next aid ahead of the cutoff time. I crushed those thoughts as soon as they arose - you just can't think about that (another valuable lesson learned at Grindstone). Jeff passed me at one point, and asked me if I was OK. I said my stomach was not in a good place, and he offered me ginger and Tums. I took him up on his offer of Tums, and chewed them up. They didn't seem to help at all, but I kept pushing. After a while, I got angry that my body was rebelling, and forced it to run. Surprisingly, it did. My stomach didn't really feel better, my hips were sore and tight, and my head was still in the clouds, but I was able to grit my teeth and overpower the discomfort. After a while of being mad, I realized that the Tums had kicked in, and I was actually starting to feel better. I passed a girl who had passed me earlier, and managed to run the whole way into Aid 7 an hour ahead of the cutoff. 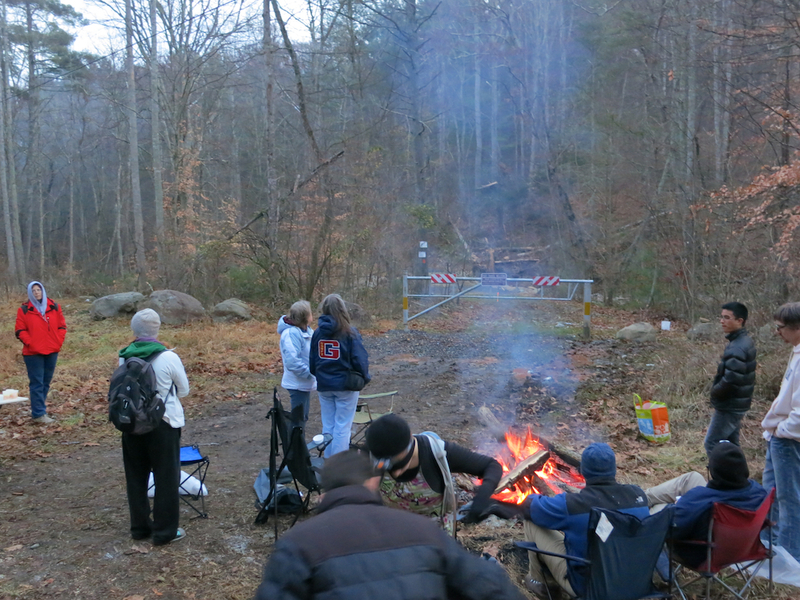 At this point in the race, it became more and more about making bridges from aid station to aid station. It had been that way from nearly the beginning, of course, but now each aid station was like a life raft floating in an ocean of pain and discomfort. I changed shoes and drank some hot Ramen at Bearwallow gap. I probably sat in the chair next to the fire for too long while I messed around with my drop bag stuff, because when I got up I was so stiff I could hardly move. I hobbled out of the aid station, with Dylan shouting a "Good luck, you got this!" at my slowly retreating back. After moving from a pathetic hobble to a slightly faster hobble, I stepped it up to a decent walk, then a shuffle, then a trot. 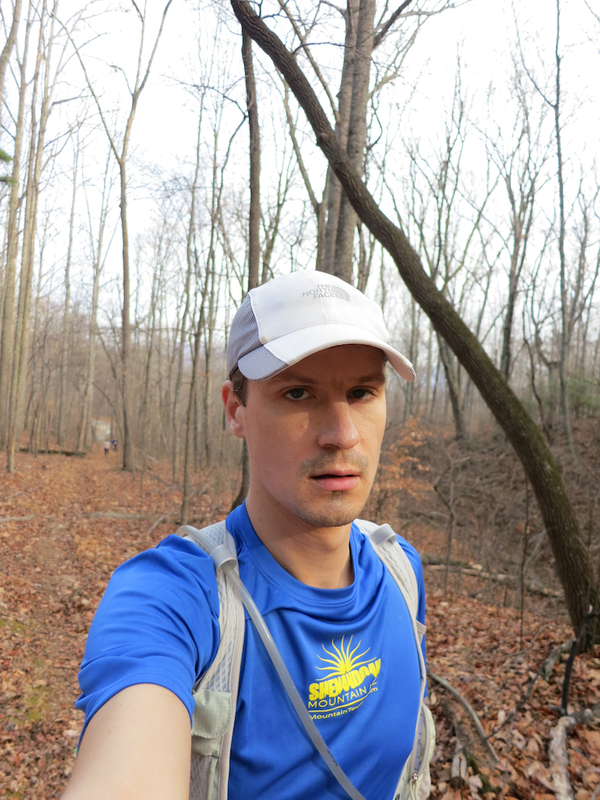 After checking my GPS watch for what must have been the 10,000th time, I made it into Aid Station 8 at Bobblet's Gap. I refilled my water bottle (or rather, asked one of the super helpful and awesome volunteers to fill it for me), and tried to eat a piece of quesadilla. It was too dry for me, and I was in doubt of my stomach's ability to accept my washing it down with water. I chewed one bite extensively but had to throw away the rest. Wondering if I'm having fun yet, somewhere in the woods. Leaving Bobblet's Gap, there was a long downhill section in which I actually managed to step my pace up to something resembling a run. The GPS data indicates that I managed to make an 11-minute pace on this section, which I feel was pretty good for being 55 miles into the race and not being in great shape. Eventually the course made a right-hand turn into a series of three up/down sections. The single track was really great, and I kept imagining how much fun it would be to ride a bike on it. After the last down section, the trail kept going for almost a mile after my crib notes said I should have reached the final aid station. This was a little discouraging, but I didn't have any choice but to press onward. I was passed by Al, who was on his way to finishing his fifth Hellgate and fifth Beast Series. 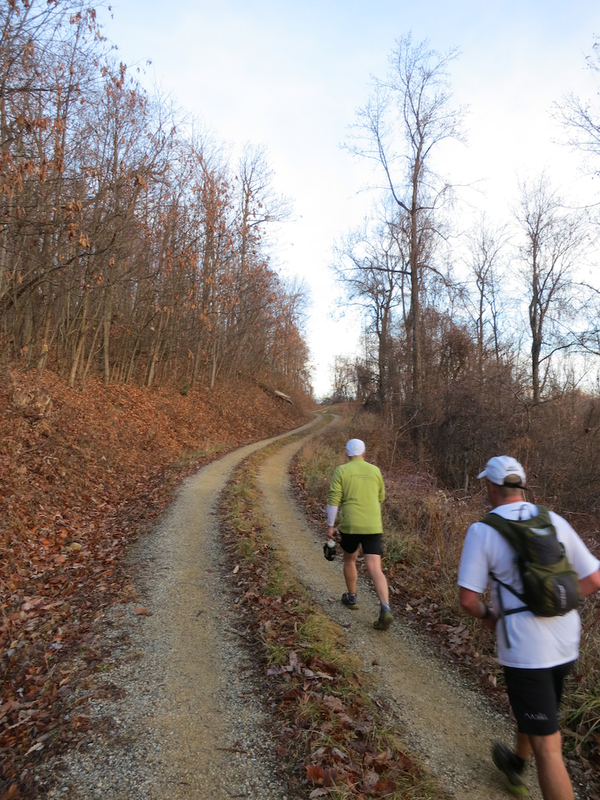 I asked him for some beta on what was coming up after the last aid station, and he gave me the welcome news that it was all gravel road; three miles up followed by three miles down. I knew that it would be a tough hill based on my elevation cheat sheet, but the fact that it wouldn't be technical greatly improved my hopes that I would be able to make it on time. 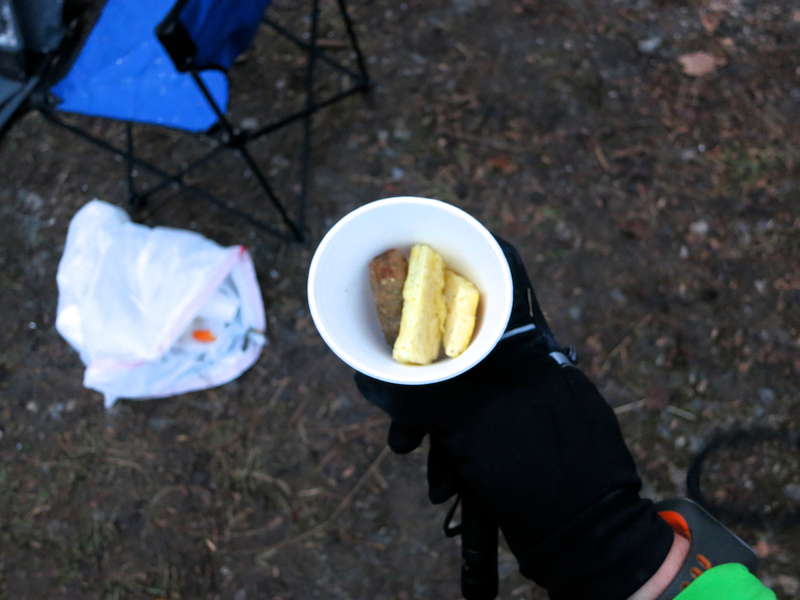 The folks at the aid station gave me an espresso energy gel and some hot chicken broth, and sounded a little party kazoo to give me some encouragement for the road ahead. I left the aid station at about 4PM, which would give me 2 hours to travel 6 miles. The road wasn't too bad at first, with the grade being manageable and non-technical. I did some math in my head (very simple math, which was all I had the mental capacity for). Al had told me that it was three miles up, three miles down. That, coupled with the fact that I had two hours of time remaining, meant that I would need to average a minimum of 20 minutes per mile. I knew that I would be able to go faster on the downhill, perhaps 15 minutes a mile. I kept an eye on my GPS, which gave me an average pace for the current mile - it stayed pretty steady at around 22 minutes per mile. This gave me hope that I would finish under the cutoff. Have you ever walked up three miles of steady uphill? Living in Baltimore, I do not have the opportunity to do this. Coupled with the extreme state of fatigue I was experiencing, the hill dragged on forever. One foot in front of the other. Check the watch. Keep moving. 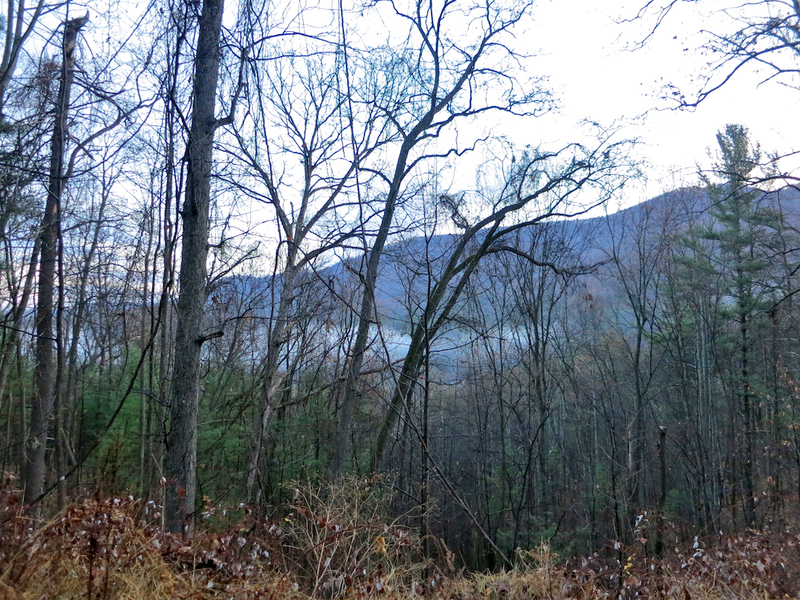 I stopped to put on my arm warmers and get my lights out, as the sun was starting to dip behind the mountains. Up. Up. Up. I reached the top almost a mile before I was expecting to, perhaps due to some error in my estimation. This was good news. I crossed the Blue Ridge Parkway and began hammering down the other side as fast as my legs were willing to. I averaged about 11 minute miles down this section, which was about the best that I could have hoped for. I could smell the barn, and tried to let gravity do all the work. Eventually I passed Al, who gave me props for having more legs than he did at that point, which I almost laughed at because I was running on nothing but fumes, gravity, and a burning desire to be DONE. I rounded the final corner into Camp Bethel and poured on everything I had, which was not much, but enough to keep me running strong straight up into the finish corral. Horton shook my hand and congratulated me. I mumbled something incomprehensible about stomach shutdown. He saw I was wearing my Shenandoah Mountain 100 mountain bike race shirt, and said "man, that's a tough race!". This cracked me up. 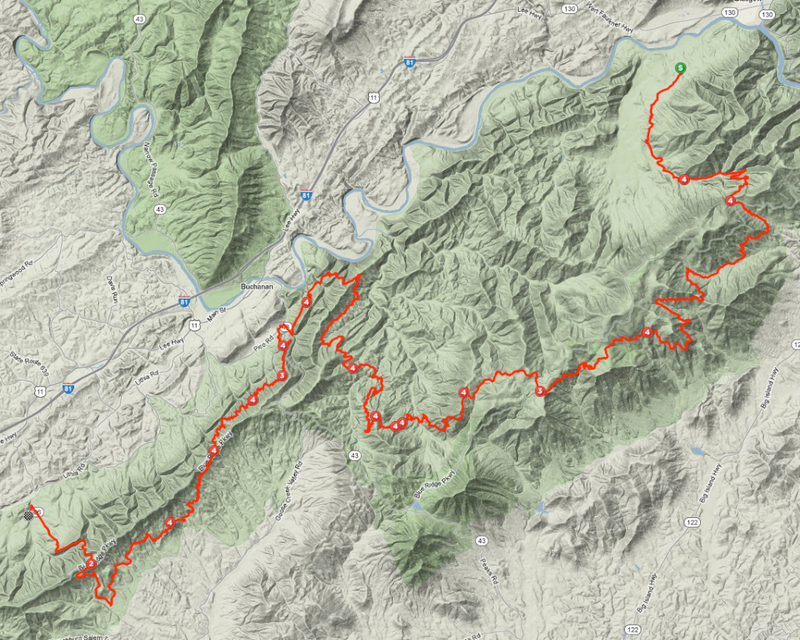 The SM100 is a long and extremely tough race, but Hellgate destroyed me so much more thoroughly that it almost makes SM100 look like a walk in the park in comparison. I collapsed on a couch inside the lodge and just stared at nothing for a few minutes, completely shell shocked. Eventually I managed to get up and walk to my car to grab my clothes and take a hot shower. I slept on one of the bunks at camp, not even caring that I had forgotten to bring a sleeping bag or pillow; I just didn't care. After a few hours of blessed rest, I got up and made the drive back to Baltimore. And that's how you survive getting run over by a bus. The ultrabomb went off in my car again.